Below, Gary above Mirion Lake, 2nd day. 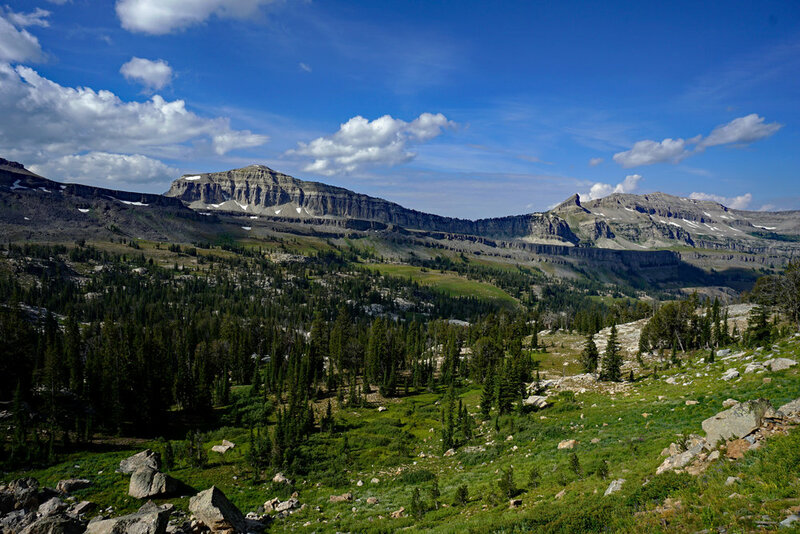 Gary Fujino and I headed over to the Teton Crest Trail for a 4 day, 3 night backpack in early September. 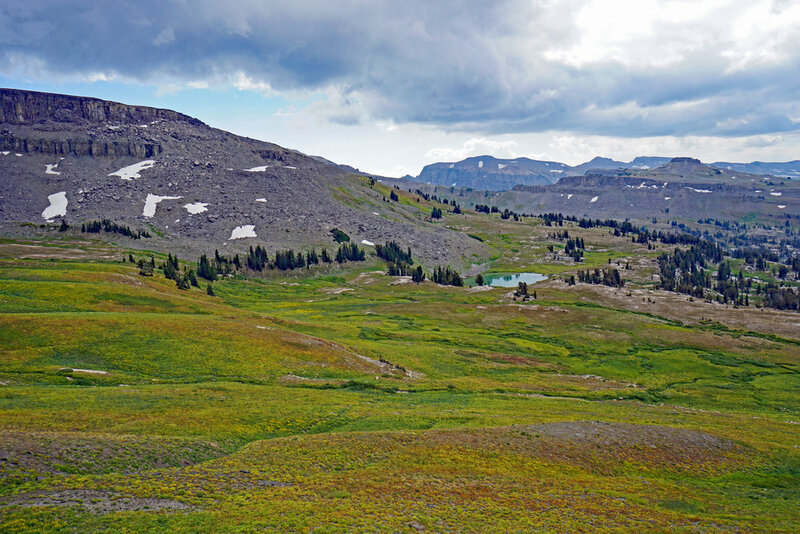 The Teton Crest Trail is a 43 mile trail that goes around the west side of the Grand Teton Pk. It has a number of entry and exits points, and our entry point was at the top of the tram in Teton Village, and we exited at Cascade Canyon. We popped in to the Moose Permit center at 7:30 am, and I was third in line while Gary went for coffee. We had camped at the Gros Ventre campground the night before. We got our permit, and headed out for breakfast. After breakfast we drove the car to Jenny lake, left it, and hitch hiked back to Teton Village. We got tickets for the tram, and headed up. The tram deposits you at 10,300', and we went down to the Granite Canyon camping area, our assigned first night's camping area. We got up and headed a few miles to Mirion Lake the 2nd day (photo above) and continued on for our 2nd night's assigned camp area, which was on Death Canyon Shelf. On the way there we saw the start of incredible flowers. Above: Gary headed for Death Canyon Shelf, where we were supposed to camp. 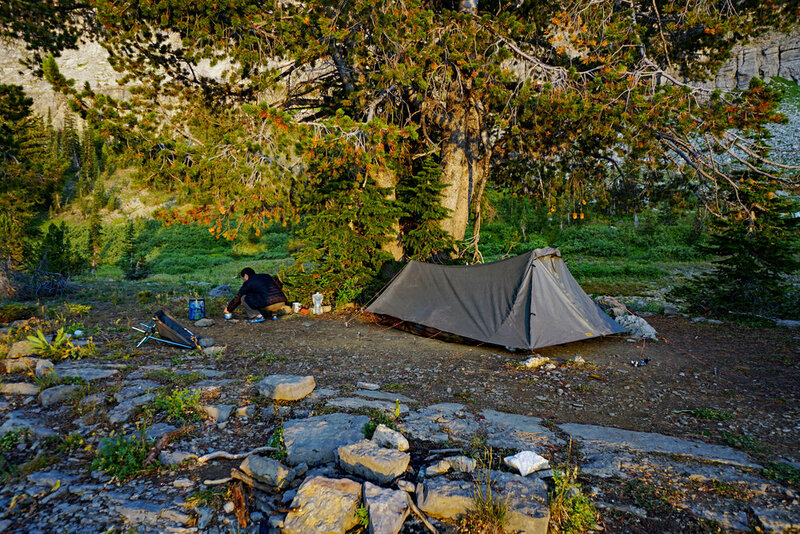 The site below was our campsite on the Shelf, and I was about spent when we found it, after 8 miles of hiking. 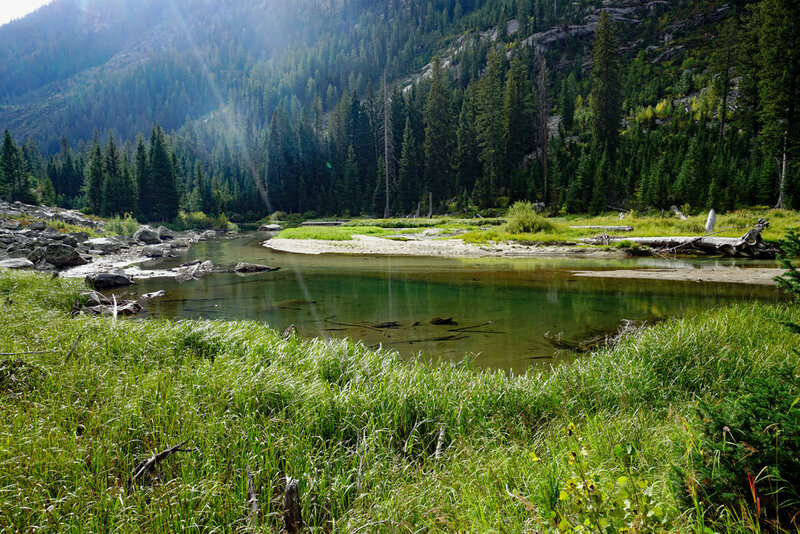 There was water nearby, and incredible views down Death Canyon toward the Jackson Hole area. That evening Gary got some great shots of a doe and her fawn in evening light. The next morning we headed toward Alaska Basin and Sunset Lake. The view below is from Alaska Basin looking back toward the Shelf. We crossed over the cliffy area at the first notch you can see to the left, and crossed the very nice alpine basin. Above, we finally got to Sunset Lake, and yes, it was really that color. 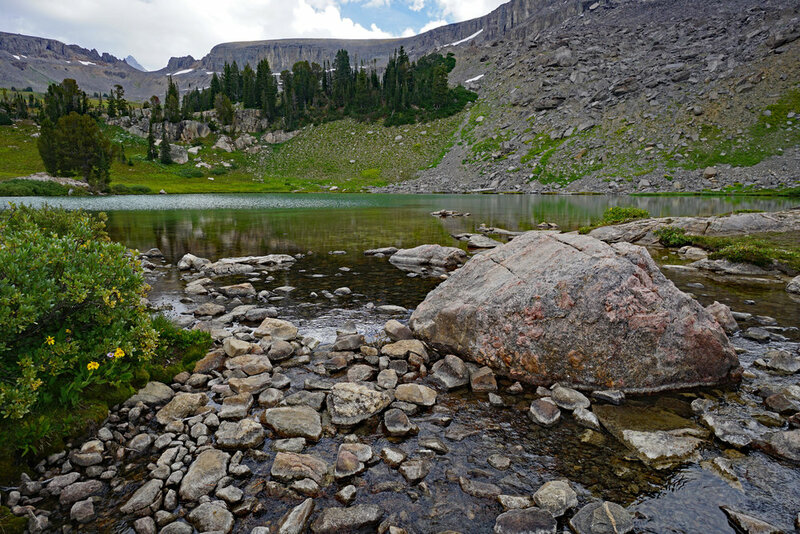 Below, the outlet of Sunset Lake. On the horizon, the tip of the Grand Teton peeking out for us. We had lunch at Sunset Lake and headed through flower fields to Hurricane Pass. The name give me a little chill, because the weather was deteriorating, and I could foresee strong winds and rain at the elevation of the pass, but all we saw was more flower fields. Above, we got some elevation above Sunset Lake, headed to Hurricane Pass.This view is of some of Alaska Basin, with Sunset Lake being the only lake we saw from the trail. Below, the view from near the top of Hurricane Pass, looking down at some alpine lakes that I'd like to camp at someday. The Peak: the Grand Teton from the backside. 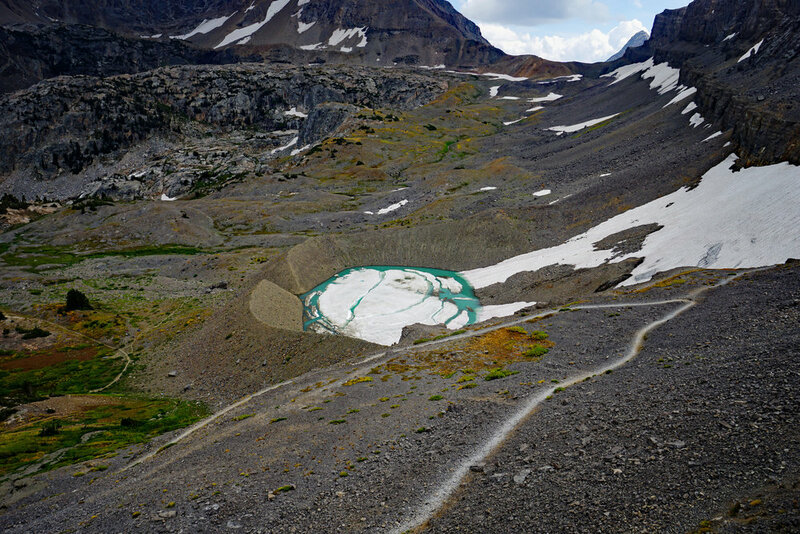 Above, also from Hurricane Pass, looking down at the strange Schoolroom Lake. It was obviously a tiny glacier that sat there a long time and made a ring shaped morain around itself. I wonder if the water broke through the morain all at once or gradually as the ice receded. I'd have liked to see the breakout, from above that is. Our third night was in the S Fork of Cascade Canyon, which required about 8 miles of hiking from the Shelf. On the 4th day we hiked about 8.5 miles to Jenny Lake, picked up Gary's car, and headed home. 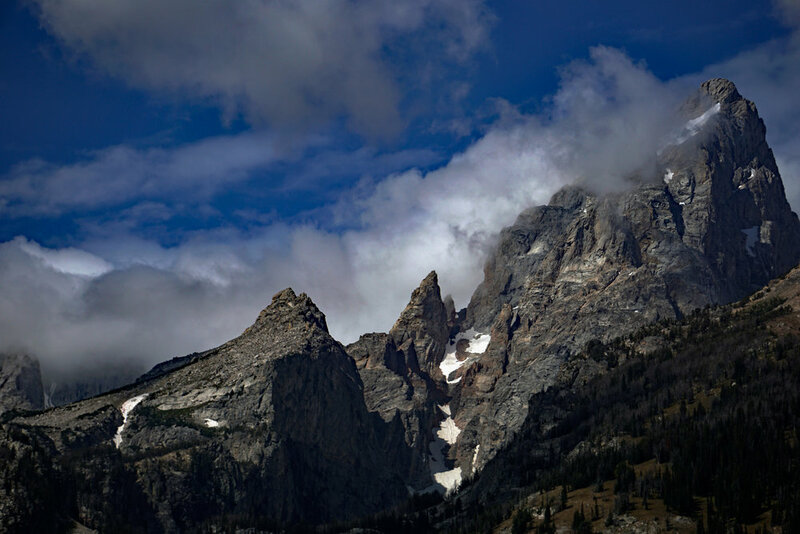 In the Jackson Hole area, we were glad the smoke had cleared and I got a shot of the front side of the Grand Teton.